CyberLab will offer you the best conditions to make your business idea ready for the market and your start-up take off! You will benefit for six months from a fully equipped working environment in the “Alten Malzwerk” in the Hoepfner-Burg in Karlsruhe. The charm of a historical industrial complex is combined with the innovative character of a hightech centre: more than 10 businesses from the IT and media industries are at home here. Das CyberLab bietet Startups eine kreative Umgebung, um die eigene Geschäftsidee zum Fliegen zu bringen. High-speed internet, fitted workspaces and the most important stationery are included in the all-round, worry-free package. In addition, CyberForum meeting rooms can be used. If you need a break you can use our kitchen as well as a PS4 and couches under palm trees. CyberLab is located in the Karlsruhe Oststadt district, with lots of lunch break options and nice student pubs for the evening. 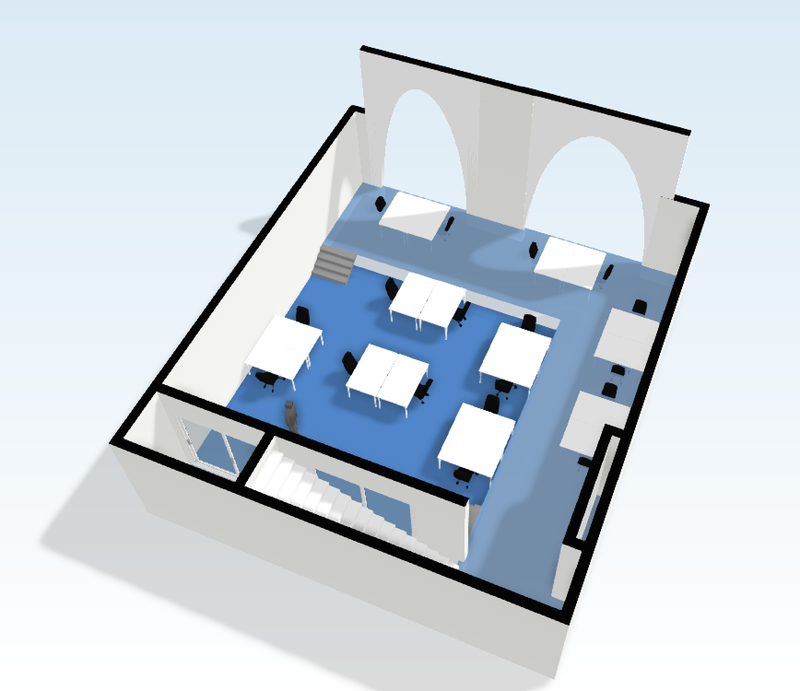 There are 2-5 workspaces are available for each team, in which you can work around the clock. You will have access to workshop rooms and meeting rooms, you can share our kitchen and you can relax on couches under palm trees. All of the rooms have air conditioning. The rent for one workspace ist 69€ per month. The workspaces include fibre-optic connections, WLAN, laser printers, 24” TFTs, HD computer projector, whiteboard, flipchart, and stationery. The entertainment infrastructure is also provided with a PlayStation. Coffee and mineral water are available for refreshment. Experienced businesspeople will support you with further growth and relevant topics such as preparing for market entry and customer acquisition. Mentoring is a free offer in CyberLab. CyberLab project management and CyberForum team will provide you with support for topics such as PR, marketing and design, business modelling and entrepreneurship. You will also benefit from our reception service. You will work one door away from CyberForum, which connects over 1,200 members from the IT industry and can open up interesting contact with key players in the region and potential investors. Matching events in which funders and investors are brought together or round tables on founding-related topics; you will benefit from our wide range of events for networking and further training. CyberLab is located in the Hoepfner-Burg in the Karlsruhe Oststadt district (around 5 mins by tram to the city centre). Car-sharing stations, the FZI Institute for Information Infrastructure and the Karlsruhe Institute of Technology (KIT) IT faculty are nearby, as well as pubs, restaurants and the Hoepfner-Burg beer garden.